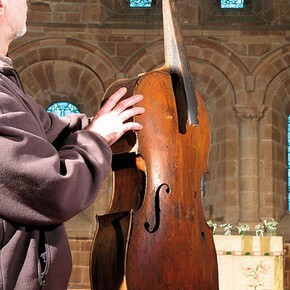 The Berkswell 'Cello Project concerns the recent rediscovery and conservation of an early eighteenth-century English violoncello. The 'cello was made by John Barrett in London, in 1720, during George Frideric Handel's first decade in London, when public musical and theatrical events were well attended by the 'middling classes' enjoying the social prosperity and cultural energy of their time (Figure 1). Musical societies and social music making were important aspects of cultural life for many, and the trade in all kinds of musical instruments and printed music was thriving. John Barrett apparently based his stringed-instrument designs on the work of Jacob Stainer of Absam (around 1617-1683), some of whose instruments were in the collection of James Brydges, 1st Duke of Chandos, at Edgware in Middlesex. In 1720 the 'cello was still at an early stage of design evolution and so Barrett's design was soon superseded by others and the 'cello was traded-in on the second-hand market. Eventually, it became the valued property of the church of St. John Baptist in the ancient village of Berkswell, Warwickshire (Figure 2). Some of its early structural design features have been preserved and early eighteenth-century parish documents record payments for the repair and upkeep of the 'cello, including for the purchase of strings and, in 1825, a specially made 'wooden box for the base viol - 5 shillings'. In the 1970s, Eric Halfpenny (1906-1979), noted musical historian, documented the Berkswell 'Cello, recording some measurements and unusual features. Thereafter, the 'cello seems to have disappeared from knowledge and record until its recent rediscovery. The instrument was probably used with others, such as bassoon, violin and clarinet, during church services and also at social gatherings and celebrations of all kinds. A special gallery was built in the Berkswell church to accommodate the musicians and choral singers (quire). These galleries, usually built in the west wings of churches, gave the name to the 'West Gallery' tradition of music described by Thomas Hardy in his novels A Laodicean (1881) and Under the Greenwood Tree (1872). This musical tradition ended in the mid-nineteenth century with the increasingly widespread installation of church organs. West Gallery instruments fell into disuse and only a few known examples survive in museum collections in England, even fewer remain in their original church settings. These galleries, usually built in the west wings of churches, gave the name to the 'West Gallery' tradition of music described by Thomas Hardy in his novels A Laodicean (1881) and Under the Greenwood Tree (1872). This musical tradition ended in the mid-nineteenth century with the increasingly widespread installation of church organs. West Gallery instruments fell into disuse and only a few known examples survive in museum collections in England, even fewer remain in their original church settings. The many challenges to the conservation of this instrument made it an ideal learning resource for the author. As well as developing better practical conservation skills, it was an opportunity to explore some aspects of the contemporary theory of conservation as discussed by Salvador Muñoz-Viñas, especially intersubjectivity and the concept of an expressive, creative and communicative role for the contemporary conservator.1 The author also collaborated with Karen Lacroix, an MA student of Communication Art and Design at the Royal College of Art, and her fellow student Joel Somerfield. The intention was to bring creative expertise to devise new ways of documenting and communicating about the conservation project. Experimental documentation was an early consideration and we decided to make archives of the entire project. Conservation documentation is usually very selective in its compilation and presentation. The incidental and peripheral materials of decision, process and creative thought are normally edited out or discarded to leave an artificially straightforward narrative record. The novel idea of collecting all the documentary materials used or encountered during the conservation process seemed appropriate. It was a way of directly conveying some rarely recorded information, including the personal role of the conservators involved who are generally noted by name only in treatment reports. The plan was to record and archive everything: condition and treatment reports; all communications, including e-mails, notes and minutes, jottings and sketches. Route maps and train tickets from journeys to visit the 'cello were kept, along with beer caps and receipts for lunches at meetings or for purchased materials, such as DV film tapes, and special paper for the project. We did not stop there: hundreds of photographic images, both technical and aesthetic; some experimental film clips, sound samples, fragments of recorded music; storyboard compositions, as well as online website material were all added to the open archives. Reference objects, such as some eighteenth-century violin pegs, tools and samples of paper and wood were included. As well as illuminating the conservation process and influences upon decision making, such archives offer a rare opportunity for insight into our methodologies, materials, relationships, our ways of communicating, and even travel arrangements and personal dietary habits in the early twenty-first century. These unconventional documentary materials convey valuable contextual information and also act as multi-sensory sources that supplement the written word. The term 'archives' normally refers to a collection or repository of historical records of primary source material. Archives can be specific to a person, organisation or event, they can be thematic or even defy categorisation. Archives can be 'open' or 'closed' denoting whether material continues to be added. The Berkswell 'Cello archives are designed both to act as open archives and to function as conservation documentation and record. The deliberate use of some actual objects as documents is perhaps an unconventional feature, but the presence of objects in other archives generally is not unusual. Such objects can have profound symbolic meanings and values connected with the work or life of the original owner. They may be actual samples of materials or things used in scientific, design or creative work, or part of an object 'library' to which reference was made for inspiration and thought stimulus. Sometimes, they may be humble objects of incidental use such as spectacles or personal artefacts. In all these cases, the traditional practice has usually been to archive the objects after the event or the demise of the owner and to document them, describing composition, known history, results of investigations and explanation of their meanings and values. The objects placed in the Berkswell 'Cello archives will have no additional documentation other than a brief reference. The objects are intended to be documents in themselves. Although they may have connection or involvement with events or process, no strict specific meanings or values will be ascribed. The viewer is invited to contemplate, handle, interpret or enjoy the objects in a personal and subjective way without the need for any prescribed reference other than the project context. Purely scientific and objective documentation is accessible only to the few, but here the ideas of subjectivity and intersubjectivity, as proposed in contemporary theory, are being taken a step further and consciously introduced into documentation. Such elements of subjectivity introduced into documentation, may enrich and extend accessibility beyond the professional realm to persons with widely differing knowledge, intellectual, mental or physical abilities. Communicating more widely about conservation was another goal of the project and this would involve film, printed work and online material. The intended audience was the general public, but we wanted to explore different possibilities and ways of discussing and presenting conservation for the consideration of our professional conservator colleagues. Early ideas of filming a conventional documentary were discarded and collaborative creativity was engaged to explore subjective and symbolic representations in image and sound. The resulting short film, The Berkswell 'Cello - Three Perspectives on Conservation by Karen Lacroix,2 discusses aspects of conservation in an indirect way, shifting the focus away from the object itself to talk about the nature of perception, personal experiences of conservation and the reasons for transmitting objects, values and meanings into the future. Early critiques of this project and its experimental aspects have been encouraging. Further development of the explored themes and some more communicative film work is planned, along with articles in print and online. The Berkswell 'Cello will feature as a major portfolio work in the author's final year of study. I would like to thank NADFAS (National Association of Decorative and Fine Arts Societies) for funding the project, Linda Hickin of Berkswell Museum, the people of Berkswell Village, staff of RCA/V&A Conservation, Alistair Gooch of Moritex UK for the loan of imaging equipment, and most of all I thank Karen Lacroix MA(RCA) for her inspiration and fine work.